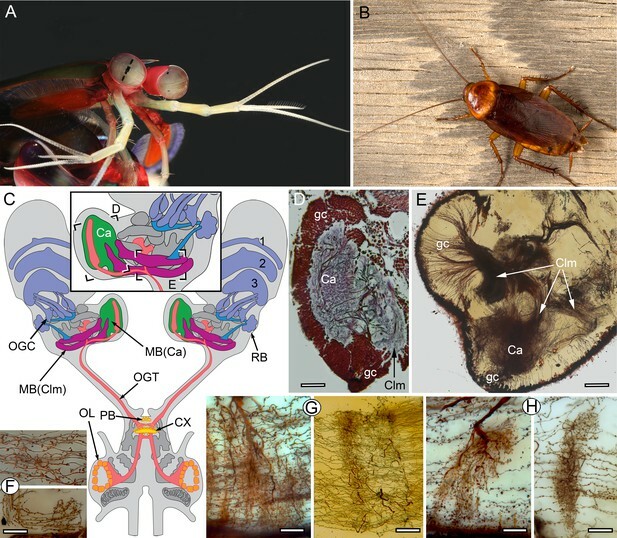 Examples of characters 1–13 shared by insect (Periplaneta americana, (P) and stomatopod (Neogonodactylis oerstedii, (N). 1. Density of dorsal cluster of globuli cells exceeds 3.0 × 106/mm3. 2. Distal calycal/domed (synonymous) neuropil. 3. Distal microglomeruli (in inset to 2,3). 4. Spiny globuli cell dendrites. 5. 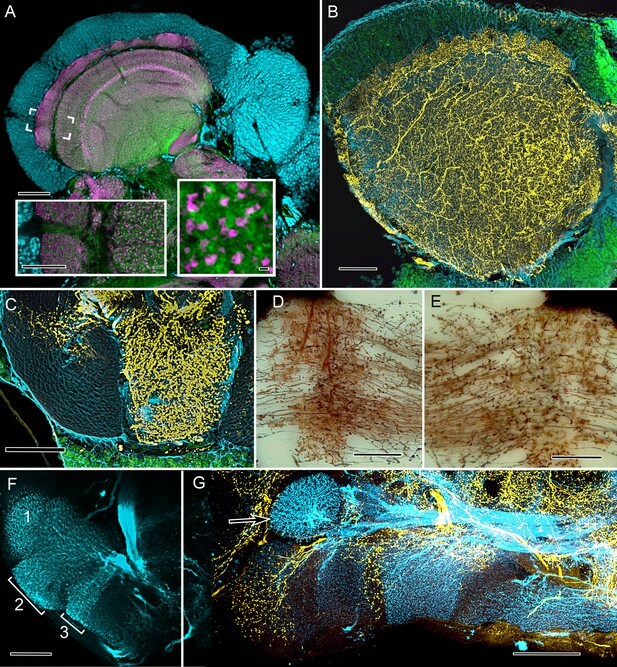 Clawed globuli cell dendrites. 6. Globuli cells lacking dendrites. 7. Parallel fibers. 8. Orthogonal networks. 9. Efferent dendritic trees intersecting columns/lobes. 10. Aminergic afferents. 11. Afferent/efferent processes partitioned in sequential domains. 12. GAD/GABAergic recurrent pathways. 13. Elevated expression of proteins required for learning and memory. 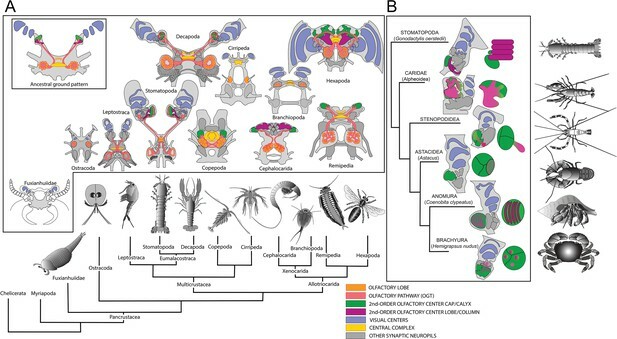 Corresponding topologies of insect and stomatopod cerebral regions. Globuli cell clusters shown green, lobe/columnar extension shown magenta. Abbreviations: LA, lamina; ME, medulla; LO, Lobula; LPR lateral protocerebrum; PB, protocerebral bridge; BU, lateral bulbs of the central complex; OL, olfactory lobes. Yellow lines connect corresponding locations. The eyestalks of N. oerstedii have been foreshortened. Mushroom body calyces in Neogonodactylus oerstedii. (A, B). 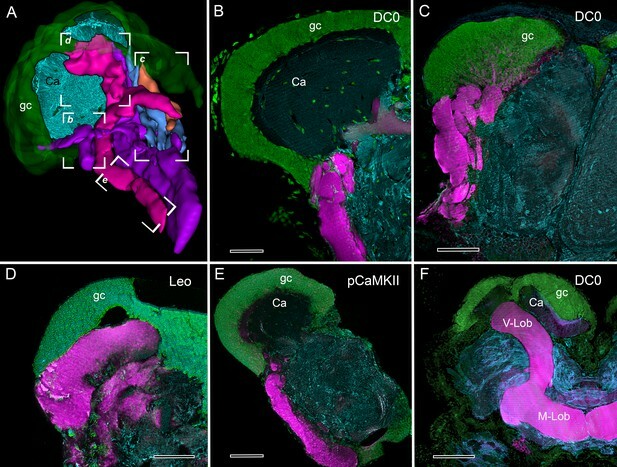 Two successive Golgi-impregnated sections of the lateral protocerebrum show impregnated globuli cells (gc) with their converging neurites (at arrows) denoting the origin of columns (Clm). Calyces (Ca) are associated with just two of the four columns. One calyx is large, bilayered (A) with the deeper inner volume (B) giving rise to its column. The second calyx is very small (boxed area, panel B enlarged in inset upper right) and entirely separate from the larger calyx. Scale bar A, B: 100 µm. 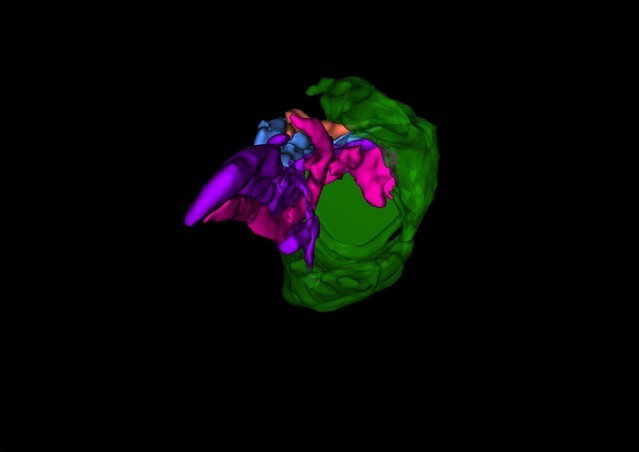 Three dimensional reconstruction of the stomatopod mushroom body. Serial section reconstruction demonstrates the dispositions and relative sizes of mushroom body columns originating from the dorsal globuli cell cluster. Mushroom body lobes are recognized by their DC0 immunoreactivity across pancrustaceans. (A) Vertical lobes (Lob) of the Drosophila mushroom bodies. (B) The single DC0 immunoreactive lobe originating from the modified calyx of the cleaner shrimp Stenopus hispidus. 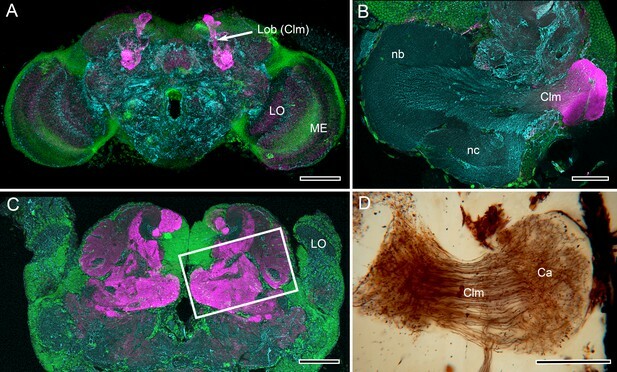 The calyx is synonymous with the hemiellipsoid body described by Sullivan and Beltz (Montgomery et al., 2016), here shown at a level that depicts their ‘b’ and ‘c’ neuropils (nb, nc). The lobe corresponds to their ‘lateral protocerebral complex’ (ref 17, Figure 3D). (C) Large convoluted lobes of the mushroom body of the pistol shrimp Alpheus bellulus. 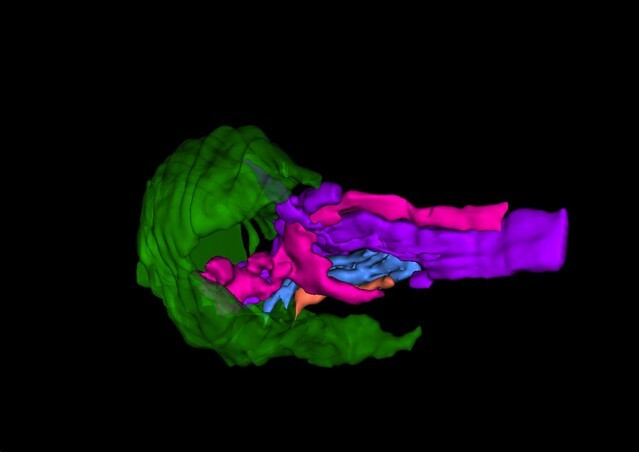 As in other pistol shrimps, the visual system is greatly reduced and the lateral protocerebrum is situated entirely within the head capsule. (D) Alpheus bellulus. 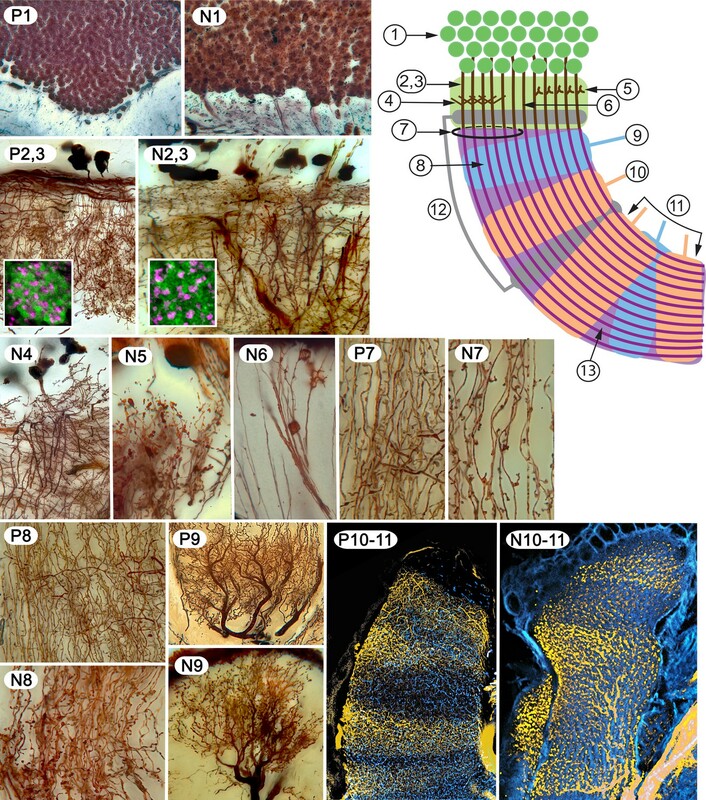 Golgi-impregnation of some of the calyx and parallel fibers of the mushroom body lobes. Anti-DC0 is labeled in magenta, cell bodies are labeled in green with the nucleic acid stain Syto-13, and anti-α-tubulin is labeled in cyan. Abbreviations as for Figure 1. Scale bars: A, 50 µm; B, C, D. 100 µm. Divergence of decapod hemiellipsoid bodies. (A) In the land hermit crab Coenobita clypeatus (Anomura) elevated expression of DC0 resolves strata in the hemiellipsoid body (HB) containing orthogonal networks corresponding to those of insect mushroom body lobes (Brown and Wolff, 2012; Wolff et al., 2012). (B) In the shore crab Hemigrapsus nudus the hemiellipsoid body lacks elevated DC0 although an axon tract from the lobula (LO) shows clear DC0 immunoreactivity. (C) In the freshwater crayfish Procambarus clarkii the subdivided hemiellipsoid body shows no elevated DC0 although structures distal to it, corresponding to the reniform body show moderate expression. Scale bars: A, C 100 µm; B 50 µm. Stability of brain organization over time. 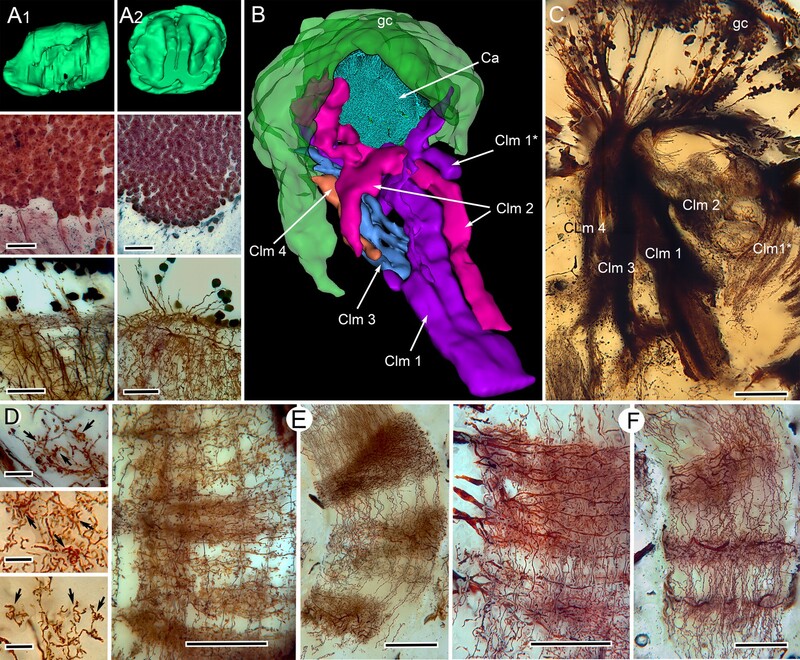 (A) Fossil brain of the lower Cambrian stem arthropod Fuxianhuia protensa. (B) Centers common to Stomatopoda and Hexapoda superimposed onto the brain profile of F. protensa. 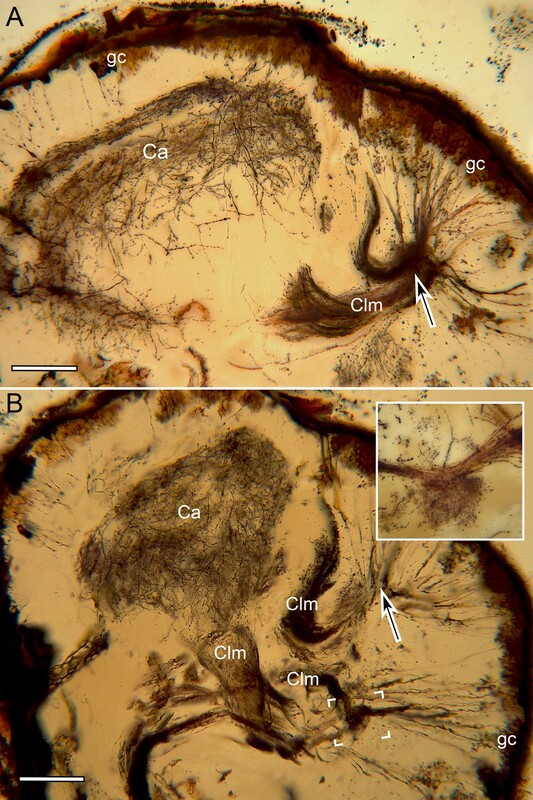 (C) Silver-stained brain of the extant coleopteran Chauliognathus profundus, shown at the same magnification as that of panel A. (D) Schematic of the brain of C. profundus. 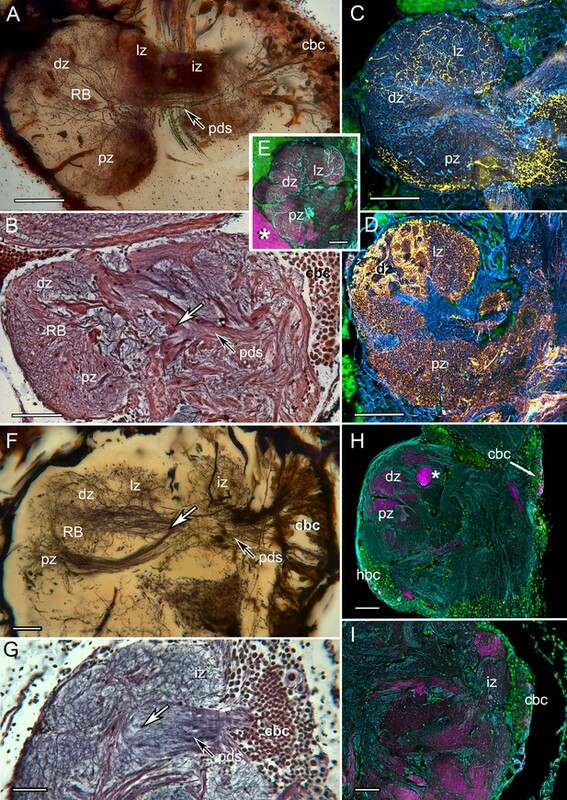 The brain of F. protensa preserved as a carbon film (Ma et al., 2015) corresponds to that of C. profundus in comprising 3 fused brain segments, which are indicated by, (1) an enlarged forebrain attached to 3 nested optic neuropils, and two peripheral sensory nerve trunks, (2) to the antennae and (3) post-antennal appendage (not shown at this level). 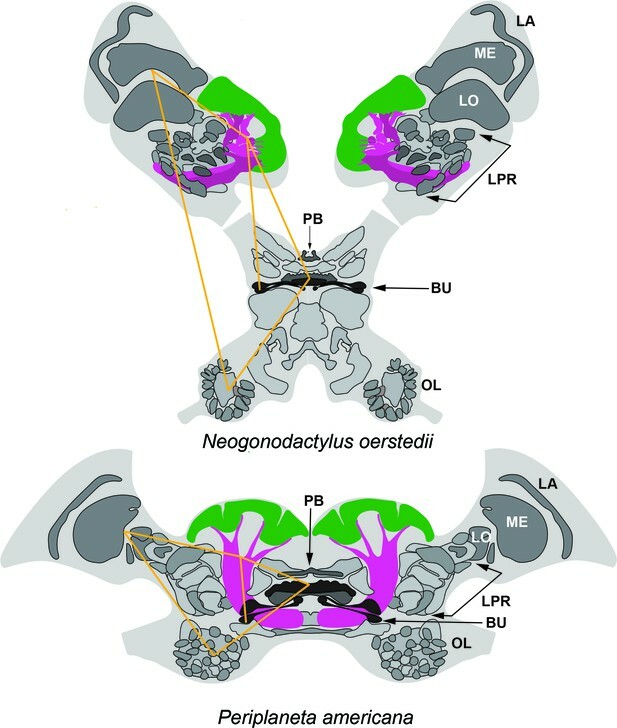 The lateral protocerebrum (LP) in the stem arthropod extends into the eyestalk, suggesting that is the plesiomorphic condition, whereas the insect protocerebrum’s location in the head capsule is the derived condition.